EIB Alert: Rush Revere Book #4 Hits #1 on Amazon! Note to Rush 24/7 members: Starting October 1st, we will no longer offer audio and video in Windows Media Player format. All of our audio and video will be accessible through the website audio/video player only. For help, please contact customer service. 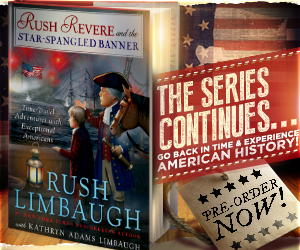 Rush Announces the 4th Rush Revere Book! RUSH: Now, normally I would ignore these sound bites that I have, but this is going to prove valuable, because what has happened here on my take on NASA's announcement of the discovery of water on Mars, we cannot move past this yet. It has entered the bloodstream of the low-information crowd in this country via late-night comedy shows and NPR. Why Is the Pope Afraid of People Finding Out He’s a Defender of Religious Beliefs? RUSH: The pope had a secret meeting with Kim Davis while he was in Washington. Kim Davis was flown to Washington for a private meeting with the pope. She's the woman that refused to issue marriage licenses to gay couples in that county in Kentucky... Why was the meeting secret? And why is the Vatican refusing to confirm or deny that it happened? An economist wrote a piece in the Washington Times explaining how the “economic center of gravity” in our country is changing. RUSH: They travel back, they meet Francis Scott Key and learn the exact things happening as he wrote some of the most iconic words in our country's history. But it's not just that. I can't give the whole thing away, but I do want to tell you that Revere and Liberty take some students back to Philadelphia when founding documents are being written. I don't want to give anything away, but this is a major endeavor. RUSH: Yesterday we had the most incredible announcement from NASA. This is what is not reported in The Politico. I don't know if these local TV info people in Dallas even know what I said. I doubt that anybody reporting on what I said actually knows what I said. I doubt that any of them actually went to my website to read the transcript of what I said and then report on it. Even after reading what Media Matters took out of context and reported, their curiosity was not even such that they would go to my website to see if what they were being told was accurate or true. RUSH: Don't misunderstand me. I'm not claiming that Vladimir Putin has assumed some leadership position with moral authority and so forth. I'm saying he's gone in and claimed it, but that's not who he is. He hasn't changed. That's what makes this so rotten and dangerous... The problem is, he's able to. The problem is we've abandoned our role as moral leader of the world, defender and liberty of freedom in the world. We've abandoned it. We've left. We've gotten out of the world. Putin is moving in because he wants to reconstitute Russia as the Soviet Union. This is a power play. RUSH: A zero tax rate, to me, is self-defeating. I think what a zero percent tax rate is, sad to say, is pandering. RUSH: They were desperately hoping. You can look at the National Hurricane Center forecast. There have been two this year, there have been two tropical storms, both of which fizzled, never amounted to anything other than low-pressure thunderstorms. But so desirous are the people in the crisis business in this country that they were giving us computer models of the direction and the wind speed and all that, and they never amounted to anything.